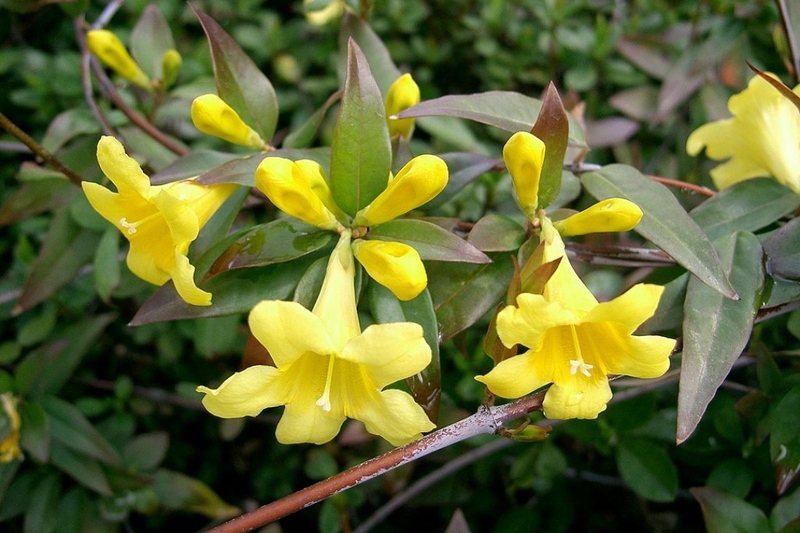 Carolina jasmine (Gelsemium sempervirens): growing, planting, caring. This climber is the symbol of South Carolina. The Carolina Jasmine, Gelsemium sempervirens is a frosty climbing plant at 0 ° C for the standard species and at -4 ° C for the 'Margarita' cultivar. It bears dark green, lanceolate, evergreen leaves on twining stems that wrap around their stake. It carries from June to August yellow flowers in trumpet, with 5 petals. Gelsemium is toxic, and used in homeopathy to fight colds. In open soil or in pot? It's simple, if at home the temperature drops permanently below 0 ° C, it should be in pot! Do not leave it in the original pot, often made of plastic - unsightly, heated when placed in sunlight, waterproof... - Repot it in a pot much larger - in terracotta! In open soil, plant in spring in a sheltered and sunny place. It requires a rich and well-drained soil because it dreads when its roots stagnate in water: do not hesitate to bring sand for better drainage. Water copiously to facilitate rooting. Very important: provide it something to climb on, like a wall with a trellis. In pots, water often, and during winter, indoors, watering three times per month should suffice. In open soil, waterings should be moderate, except in case of intense drought. Cut any dead, damaged or diseased shoots with pruning shears. You can also remove any shoots that cause overcrowding. Your Carolina jasmine is non-hardy - it will not survive a frost episode! If your plant is outside and you fear a very cold period, add a thick layer of mulch, and protect it with some insulation material if you can. Well after the last frosts, you can bring your potted potatoe vine outside in a sheltered, sunny place! Apply a high-potassium fertilizer which will promote abundant flowering. Wood ashes actually make a good potassium intake! In any case reduce the amount of fertilizer at the end of the summer and stop completely in early autumn. Repot at least every 3 years, in a larger container if necessary, and change most of the medium, bringing soil and sand for a good drainage.